ASK AN ATTORNEY: LEGAL CLINIC FOR ARTISTS | Miami Center for Architecture & Design, Inc.
Are you a playwright, theater group or creative with a legal question? 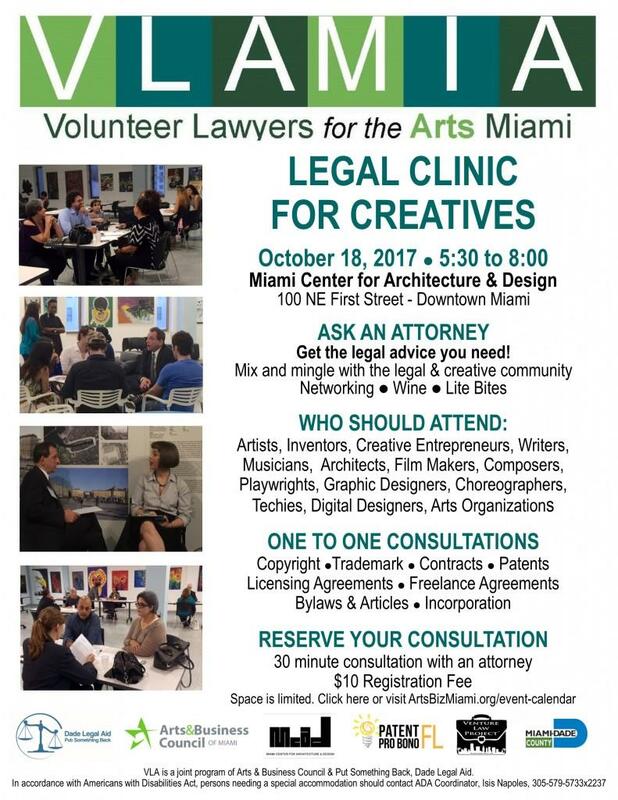 Join the Arts & Business Council and Dade Legal Aid on October 18th from 5:30 to 8:00 for our annual Legal Clinic for Creatives at Miami Center for Architecture & Design – Downtown Miami. Need help with copyright, trademark, patents, contracts, licensing agreements, freelance contracts, incorporation, litigation and more? Lawyers from Volunteer Lawyers for the Arts and Patent Pro Bono FL are ready to answer all your questions. Register today www.ArtsBizMiami.org/event-calendar. Use code AIA.